I turned hard and the car bounded down the rutted lane of an old country road. I was following a sign I’d spotted but couldn’t read. This was the part of Ireland where the people speak little English and their signs speak none. The ruts ended in sand at a seaside cemetary. You could see what used to be the church, it’s stone skeleton draped in ivy having been long deprived of it’s wooden roof. Or maybe it had been thatch. Both were common here. The waves splashed the stones below, a silent movie, made so by the wind rolling down the hillside. The Celtic crosses stood defiant like lighthouses in the turbulent sea of emerald grass around them. Warning the living? The dead? I can’t say because these voices, too, spoke in the native tongue from which English has borrowed few words. 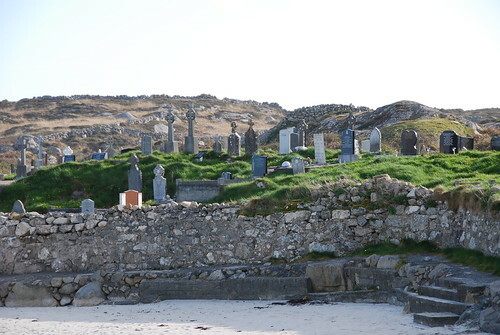 Posted on April 5, 2009, in Europe and tagged Europe, galway, ireland, prose, short post. Bookmark the permalink. Leave a comment.